In this tutorial, I’m going to walk you through using a cheap green screen setup that can be purchased for around $100. Let me be the first to tell you that I’ve never really liked green screen – especially cheap DIY setups. At a previous job as the lead videographer at a small college, we had a green screen studio for recording tutorials and promotional videos. But in a small space with mediocre lighting, it was difficult to ‘get a good key,’ meaning to be able to easily remove the green screen background while editing. A good green screen shot is a delicate balance of good lighting, a screen without creases, and enough distance between the subject and background to limit any ‘green spill’ from appearing on the subject. This spill can make it difficult to remove the green screen cleanly while editing. 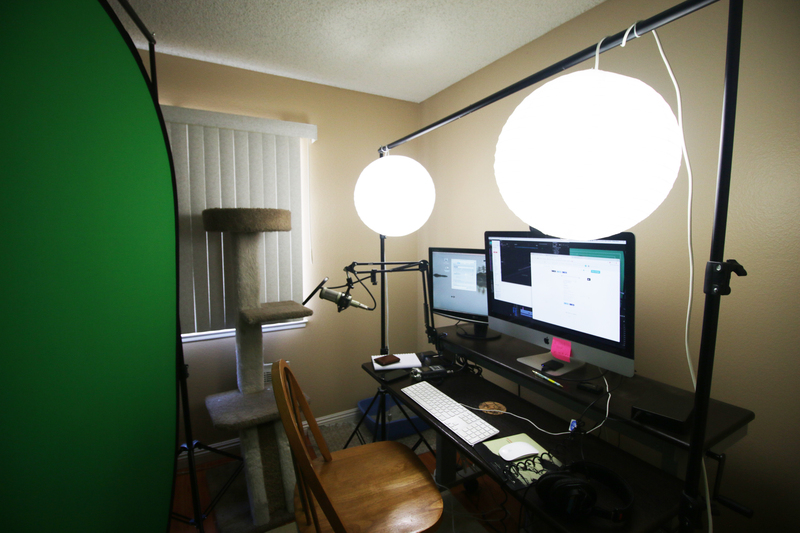 For years I’ve stayed away from even trying a green screen home setup. I’ve been happy with the gray paper backdrop that I’ve used for many of my shoots. I also just like using real backgrounds because green screen always looked funky to me. If it’s not done perfectly, it looks amateur. While prepping to record a new Adobe Lightroom photo editing course with Jon Haase, we made the bold decision to include a green screen shot in our tutorials. Jon already had the equipment. I didn’t. I hopped onto Amazon, found a collapsible 5’ x 7’ backdrop with a great price and the best reviews, and went for it. 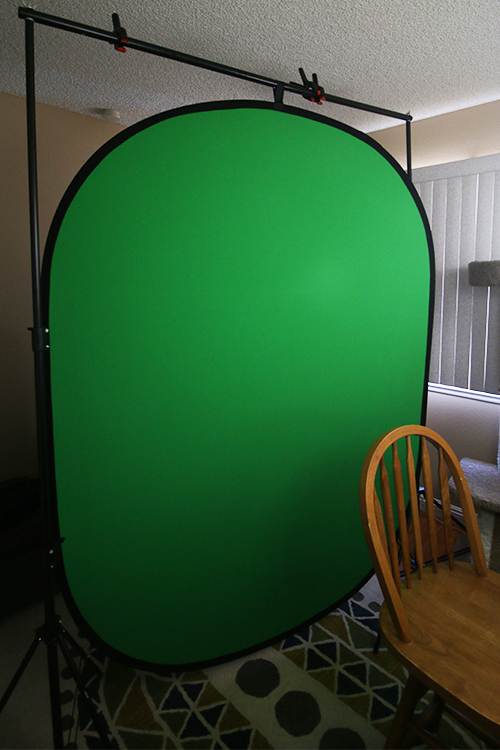 If you’re interested in getting the same one, it’s the Fancierstudio Chromakey Collapsible Backdrop (there are a few other brands that look very similar – and probably are). To hold up the screen, I purchased a backdrop stand and some clips. The screen isn’t huge, and I debated over getting one of the larger cloth backdrops that could cover more area. But for my intended use of simple talking head without much movement, the 5’ x 7’ disk should do. I wanted to test out how it looks with the easiest camera setup – my Logitech c920 webcam. I’m recording audio with the Heil PR-40 connected to the computer via a Zoom H264 recorder. I edited the video in Adobe Premiere Pro with the Ultra Key effect. Keep the green screen flat. Large wrinkles will create shadows that make it hard to key out the entire background. Light the background & the subject. Think of the lights you use to light your subjects as completely separate than the background lighting. Lighting from the front will cast shadows on the screen, so you’ll need additional lighting specifically focused on the screen to get rid of those shadows. Use crop to cut out the majority of the video your subject isn’t in. Why worry about trying to key out the top corners of the screen when you can just crop them out cleanly. Adjust the spill suppressor to remove any green tinge of color on the edges of your subject. Light reflecting from the green screen may appear on the edges shoulders, head, and arms. Most video editors with chromakey (green screen) effects have a spill suppressor that can help with this.